Students gathered on Saturday afternoon in Downey House for a mindfulness workshop on radical interdependence led by meditation teacher Kate Johnson. Ujamaa and Mindful Wes collaborated to organize the workshop, which covered topics including resilience, interconnectivity, and mindful social justice practices. Johnson is an interdisciplinary teacher, writer, and dancer who has worked in meditation centers, public schools, museums, and other artistic environments. The workshop combined mindfulness practices and the Buddhist concept of interdependence with discussions of social justice, and gave students techniques to stay mindful in fights against oppression. Johnson’s workshop on radical interdependence was her second visit to Wesleyan after teaching a workshop on mindful compassion and equanimity last year. Inayah Bashir ’20, a member of Ujamaa’s logistical board who helped organize the event, said the intent behind the workshop was partially in response to a demand for events surrounding mental health and wellness voiced at one of Ujamaa’s meetings earlier his year. Bashir said that the workshop aimed to start conversations about mental health and solidarity, citing studies referenced by Mental Health America that showed the prevalence of mental illness stigmas in African-American communities. “We started this initiative so that people of color and people who are interested in social justice work could learn practices that are helpful for themselves with managing stress and dealing with things, but also for building community and solidarity with one another,” Bashir said. Bashir collaborated with Emma Leuchten ’19, who is this year’s mindfulness intern at the Office of Religious and Spiritual Life. Leuchten was interested in inviting Johnson to campus after finding her website and reading about her work on the intersection between mindfulness and social engagement. The group participated in three short mindfulness practices led by Johnson: a practice to mark the beginning of the session in which students focused on connecting their breathing to a global breath, a practice to mark the end of the session, and a practice to help individuals find liberation from oppressive thoughts or feelings. This practice is encapsulated by the acronym RAIN which instructs students to Recognize the feeling as internalized oppression, Allow the feeling in themselves by softening to it, Investigate the feeling by taking a few moments to notice if there was a subtle thought behind it, and finally, Nourish the self as a close friend would. This practice, developed by clinical psychologist and author Tara Brach, was intended to help students be with pain in a tranquil way. “It’s an opportunity to acknowledge what’s happening in the heart,” Johnson said while leading the exercise. Shirley Fang ’19, who came to the workshop to solidify and renew their mindfulness practice, said that in the days since the workshop they have incorporated the mindful practice of RAIN into their everyday life. Another section of the workshop centered on the idea of connectivity in social justice and the importance of finding community in fighting oppression. Without an awareness of the interconnectivity of all humans working toward equality, Johnson said, the concept of social justice can seem overwhelming. 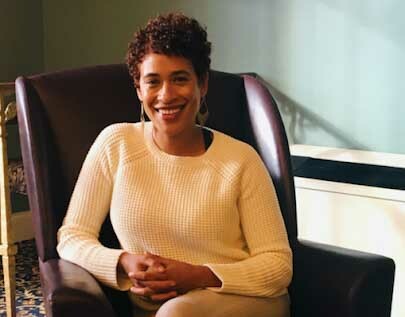 Bashir said in a conversation before the workshop that Johnson’s emphasis on mindful community building around social justice was something she and Leuchten had discussed with Johnson before she came to campus. Bashir added that mindfulness could be a way to encourage a culture of “calling in,” which she explained as a form of communication that acknowledges when something said or done is wrong or oppressive, but does so in a way that encourages the person who did wrong to be receptive to critique. “Personally, I feel that there’s such a culture of calling out, especially with social media and media in general and our president, it’s not a calling in, so maybe we can use the practice mindfulness as a way to call in,” Bashir said. Reflecting on the event, Leuchten said she was happy with the group’s engagement.